India's Congress party has appointed a new chief minister in Maharashtra state, a day after his predecessor quit amid corruption allegations. Ashok Chavan resigned amid claims that homes meant for war widows and veterans in an upmarket area of Mumbai (Bombay) went to relatives and officials. He denies wrongdoing. 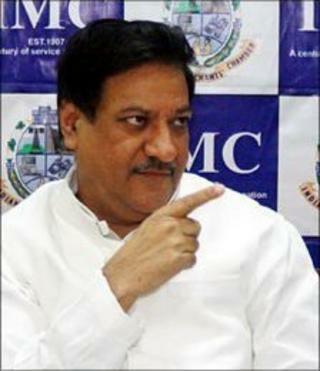 His replacement Prithviraj Chavan, no relation, is a former federal junior science minister. Commonwealth Games organiser Suresh Kalmadi also quit his party post. His resignation, on the same day as Ashok Chavan, is being viewed as an attempt by the governing Congress party to send out a message that it is tough on corruption, as the winter session of the parliament begins. The much-maligned Mr Kalmadi has been under investigation over the sleaze claims that dogged October's Commonwealth Games. He also denies wrongdoing. The event's organising committee issued full-page advertisements in newspapers on Tuesday outlining its expenditure in an effort to counter what it called "inaccurate" media reports. The main opposition Bharatiya Janata Party (BJP) said the resignations amount simply to a cosmetic "eyewash" by the ruling party. "They prove that members of the Congress party were involved in corruption in the Commonwealth Games and had denied property rights to war widows in the Adarsh Society scandal," said BJP president Nitin Gadkari. Mr Chavan has worked closely with Prime Minister Manmohan Singh as a minister in his office and is seen as a relative newcomer to Maharashtra politics. He has an engineering degree from the University of California, Berkeley, and is a member of India's upper house of parliament. Ashok Chavan was forced to resigned on Tuesday by the Congress party. Reports say he had offered to resign late last month, but the party leadership asked him to stay on for US President Barack Obama's visit to the city last week. He denies involvement in a corruption scandal involving plush apartments in the upmarket Colaba district of southern Mumbai. The homes - two- and four-bedroom apartments costing up to $1.5m - were supposedly reserved for veterans and widows of a brief conflict with Pakistan in 1999 in Indian-controlled Kashmir. Family members, bureaucrats and army officers were allegedly among those who obtained properties at the 31-storey Adarsh Housing Society block for a knock-down price. It was a sudden fall from grace for Ashok Chavan, who just days ago was shaking President Obama's hand to welcome him to India. The western state of Maharashtra is one of India's most affluent. It contributes more than 40% of national revenue and its capital, Mumbai, is India's financial centre and home to Bollywood, one of the world's largest film industries.